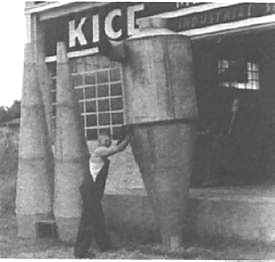 Kice Industries was originally organized as a four-way partnership in 1945 at the end of WWII when J.W. “Bill” Kice and his three sons, Jack, Russell and Jim started construction of the first shop building. They started operating as a business in January 1946. At that time, the business was known as Kice Metal Products Company. Beginning in May 1968, they began operating as a family-held corporation. Before then they did not pay much attention to titles (everybody did what had to be done), but each partner had his basic responsibility for production and service. Jack (the eldest son) handled engineering and advertising, Russell handled sales and administration, and Jim was in charge of manufacturing. Bill retired soon after incorporation but continued as Board Chairman several years. Russ became President and Sales Manager; Jim’s title was V.P., Production; and Jack’s was V.P., Engineering. Jack was elected Board Chairman when Bill died in 1972 and held both titles until he retired on his 70th birthday, Jan. 10, 1985. At that time, Jim took his place as Board Chairman. Russell’s and Jim’s sons all held positions with the company. The history of Kice Industries company reaches back to the early 1870’s when Ira Kice started his blacksmith shop a few miles northeast of Wichita, Kansas. While growing up, young Bill Kice loved to watch his grandfather shoe horses and make wagon wheel rims, plow shares and all kinds of tools and hardware needed at that time. Bill learned a lot about metal working in that shop in his early teen years. Later he began a four-year sheet metal apprenticeship in 1913 in Wichita after several years in Texas where he gained some milling experience in Corpus Christi. Allis Chalmers built many large flour mills in the southwest to feed Europe during the early 1920’s. Bill handled the sheet metal installation in a number of those mills. He continued to specialize in mill metal work during the remainder of his lengthy career, although he engaged in other phases of metal work too, especially in heating systems and aircraft sheet metal work. Bill Kice with Cyclone. Bill Kice, founder of Kice Metal Products, shown in front of his plant in the 1940’s. The following story may be of interest at this point. Beech, Cessna and Stearman (now Boeing) were getting started in Wichita around 1924-26. During the Allis-Chalmers mill-building period, Bill operated two shops – one based in Wichita, the other that he moved from mill to mill. When the mill projects phased out, he stored the extra equipment in one end of the Wichita shop. He permitted Walter Beech’s mechanic to use this equipment occasionally. Although airplanes then were mainly sticks and fabric, some parts like control tabs, gasoline tanks and brackets were aluminum. Walter Beech visualized the trend to all-metal airplanes and wanted to buy the extra shop. Bill said, “Walter, when you’ve got the cash, you can have the machines.” The Beech mechanic continued to work occasionally in the Kice shop for a month or two. Eventually, Mr. Beech sold a plane, gave Bill a check and moved the equipment to his own facility. The airplane industry has come a long way since then, but there were at least 15 or 20 firms in Wichita during the twenties who built a few airplanes and many of them bought sheet metal parts from Bill. 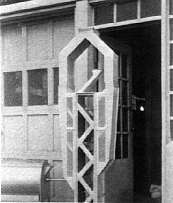 It is likely that these early contacts with aeronautical people gave Bill a practical understanding of airflow, which led to his “Kice-Type” long-cone, scroll-entry cyclone collector design in 1927. These principles have never been improved upon and are incorporated in most cyclones worldwide today. In 1929, he sold the Wichita business before the stock market crash and the Kice family moved to Newton (Kansas) where they lived for four years. Bill managed the sheet metal department for a large hardware company. Jack, the oldest son, went through high school at Newton, working in the shop on Saturdays and summers. He worked with Bill on the first air conditioning installation in a Kansas theater. This was a major influence in his future years. There were four flour mills in Newton. They all relied on Bill for their sheet metal needs, and it was during this period that he invented the Kice Multi-Aspirator® and installed a growing number of cyclones. These installations proved the benefits of his long cone, streamlined flow design. P. R. “Mac” McIntyre (whom later founded Utah Mill and Machinery Co.) was superintendent of Newton’s largest mill. He asked Bill to present a paper on cyclone design for an upcoming AOM regional program. This proved to be a subject of much interest, and Bill spoke on several programs, including the national conference in 1939 at Kansas City. Early prototype of Kice Multi-Aspirator® is one of the first designs created by Bill Kice. This was published as an AOM bulletin and included in their Volume II collection of outstanding papers between 1937-1943. Incidentally, Jack illustrated this paper, the first of many AOM contributions during the following 45 years. After four years in Newton, Bill decided to go back into business for himself. During the worst depression years, most of the Kansas mills had continued operating, but with little or no maintenance. There was considerable demand for Bill’s services as a sheet metal millwright . . . renewing the old rundown dust control systems, re-spouting and repairing the mills in general. These years between the depression and Pearl Harbor were busy years for Bill and his three sons, Jack, Russ and Jim. Jack studied mechanical engineering in Chicago, dividing his studies between Armor Institute of Technology and Chicago Technical College (the first accredited school in the U.S. to offer a curriculum in air conditioning). He earned his way as a sheet metal worker and draftsman. After school, he got married, had a son, and worked for Frigidaire, then Lennox where he was their first air conditioning engineer. These years before World War II were the industry’s pioneering period. Russ worked summers with his dad while in high school, got his business degree at Wichita State University while operating Kansas Mill’s cereal lab at night. He also married, had a son and became a production expediter for Beechcraft before Pearl Harbor. Jim, ten years younger than Jack, spent these years in high school and fabricating flour mill machinery for Forster Manufacturing Co. of Wichita – a major supplier to the Milling Industry before 1950. These activities were halted by the war. Bill became superintendent of Maintenance for Cessna, supervising the construction of numerous buildings and installing the machinery in them during this crisis period of expansion just before and during WWII. Jack returned to Wichita as an engineer for Boeing mainly involved in heating and pressurization of the B-29 cabins. He was put in charge of constructing a large laboratory to duplicate stratosphere conditions. He remained to supervise high altitude tests and research activities until the war ended. Russ and Jim were younger and volunteered for service in the Navy. Russ became navigator of a troop transport ship. Jim became a Sea Bee, building landing fields and other facilities in the Pacific Islands. He spent several months after the war in Japan. Almost two years before the end of the war, Boeing set up a planning committee to consider post-war developments for the Wichita facilities. Jack was on the committee and proposed that Boeing manufacture air conditioning equipment in the Wichita facility. He was asked to prepare detailed plans, which were approved by Boeing management, but vetoed by the Air Force, who owned the buildings. Several of Jack’s proposals were patentable. Boeing gave him the patent rights which he later sold to Coleman Company, Wichita. This was the beginning of Coleman’s Heating and Air Conditioning Division that Jack managed for eleven years. During the war, Bill and his sons had agreed by correspondence to go into business together when peace returned. The patent sale permitted Jack to match dollars with Bill which, with the mustering out pay that Russ and Jim contributed, financed the construction of a 1900 sq. ft. shop building and enough equipment to start Kice Metal Products Company – initially a four-way family partnership. Kice Metal Products Company began building its own building in 1945 but date their beginning as January 1946, when they moved machinery into the building and began production. If ever a company started modestly, it was Kice Metal Products. Russ took care of the bookkeeping at night. Jack did the design work on weekends while working week days for Coleman. Jim and Bill worked lots of nights too. Money was pretty tight, but their supply of steel was even tighter. American steel was needed in Europe to repair their war-torn industries, so it was on allocation, based on companies’ purchases in 1941. New companies with no pre-war purchase records were out of luck. When Kice Metal Products built the initial shop building, they needed 32 foot span roof trusses. None were available, so they designed their own, fabricating them from used pipe and rod from old oil wells. They could sell Bill’s cyclones and aspirators, but could only make them if the customer could furnish the steel. Fortunately, they were able to stay busy on sub-contract manufacturing for Coleman, using Coleman’s steel. It was not very lucrative, but it kept the bills paid until steel became available, about 1949. The availability of steel encouraged Kice’s first plant expansion. They added a new section the same width and length as the first building, but with 22 feet ceiling height (10 feet higher than the original section). It was two stories high in front, providing space for a plant office and a drafting room, as well as a storage balcony and a big room covered by an overhead crane. The crane replaced their original makeshift hoist – a block and tackle hanging from a limb of a tall cottonwood tree that had to be cut down to make room for the new section. It is interesting to note that many plant expansions have occurred since – a total of 160,000 square feet of floor space – and all the shop space has been designed with ceiling heights of 20 feet or more – practically all of it covered by heavy duty cranes. Sales and production started moving that year and the next. Up to this point in time, most of their jobs were sold to mills located in Kansas. This was the year (1949) that Pillsbury began buying Kice-type cyclones for many of their mills all around the country. Also, this was the year General Mills discovered that Kice’s Multi-Aspirator® was responsible for the exceptionally high yields recorded by their mill in Wichita. General Mills Inc. began ordering aspirator systems most every month – complete systems with cyclones, piping and fans. Kice purchased the fans for these systems. It was too good to last. The Korean War started in 1950. Suddenly, Uncle Sam needed all the fans produced by the industrial fan manufacturers. Fans suitable for the General Mills Inc. aspiration systems could no longer be purchased. This forced the “Kice Boys” (as they were called then) to make their own fans. It was a new step – but a successful one. They discovered they could make fans that were as good as they could buy – even better in some respects. 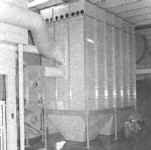 Their fan units were designed to be as sanitary and easy to clean as possible, a much-needed feature in flour mills. 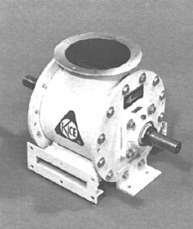 Mills also needed fans for 24-hour, heavy-duty service, so this became the Kice standard design. Special attention was given to dynamic balance with the aid of electronic balancing equipment, the same as used by Boeing for balancing jet engines. Kice fans were quickly accepted by the Milling Industry. Today, fans are the third largest Kice product division. The advent of the Korean War created a shortage of industrial fans, forcing Kice to begin manufacturing fans. Their first fans were single-stage radial types for typical mill dust control applications. Then they became interested in developing multi-stage fans to develop high-pressure differential for pneumatic conveying systems. 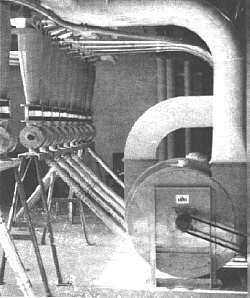 A totally pneumatic mill had been built in California that year and another was operating in Canada. They had been built by European companies who had experience supplying new mills, most of which were pneumatic, to replace bombed-out facilities. The advantages were obvious. With the cooperation of Garland King and Ross Milling Company, who was increasing capacities of three of their mills, Kice designed a number of multi-lift pneumatic systems to handle the expansion. Pneumatic conveying necessitated developing another new line of products: airlock valves. Fortunately, Jim had some machine shop experience during his years in the Navy, so he set up a small machine shop under the balcony. At that time, most airlock valves were made with vanes sealed by rubber tips. Kice quickly determined that the 24-hour duty required for flour mill applications demanded fully machined, close tolerance construction. From a very modest beginning, Kice airlock valve production has grown to several thousand airlocks and pneumatic valves per year. These early systems provided the opportunity to check the Kice Pneumatic Equations, a new approach for calculating pneumatic system design requirements. Jack had dealt with comparable air system engineering during his years with Boeing. The equations are applicable to every type and size of dilute phase lift, being based on fundamental factors that are usually short cut in other calculating procedures. Many thousands of pneumatic lifts have proven the accuracy of the equations, which have since been programmed into Kice’s engineering computer software. Second floor of Kansas State University specialty mill. Kice pneumatic system is located on the upper deck with three sifters below. In spite of success with their small pneumatic systems, Kice had difficulty selling their first total mill system, because they could not refer to a previous total mill installation to prove their capability. This problem was overcome in 1959. Kansas State University built a new pilot mill to replace the old facility that had burned down a few years earlier. The state paid for the new building and industry suppliers donated equipment, some from Italy, Germany, Switzerland and England, as well as from U.S. companies. Kice Metal Products donated the pneumatic conveying systems, a total of 26 lifts with two multi-stage suction fans and several positive pressure lifts with air pumps donated by Schwitzer. Jack also obtained an air washer donation from Carrier’s Industrial Group, combining it with Kice equipment to provide complete temperature, humidity and air circulation control – the first “air stabilization” system, although the system name came later. Kice Metal Products also donated the engineering services for coordinating the donated equipment (in four languages and two measurement systems) and preparing design details to fit flow sheets prepared by Kansas State. Jim Kice supervised the installation of the equipment. The KSU mill worked so well and looked so good in spite of space limitations that U.S. mills began accepting total pneumatic systems by Kice. Pillsbury also accepted the idea of air stabilization. Unfortunately, Carrier decided to close down their Industrial activities, and Kice Metal Products did not make air washers at that time. Nevertheless Pillsbury contracted for Kice design services for an air stabilization system in their new mill in Los Angeles, and in Ogden, Utah, a year later. Pneumatic mill located in Lagos, Nigeria. This was Kice’s largest project to date. 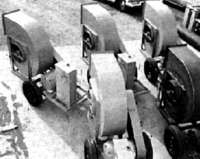 In 1960, Allis-Chalmers Milling Division was awarded a contract to build two pneumatic mills in Lagos, Nigeria (6000 and 2500 cwt daily capacities). Kice supplied the pneumatics and all the other air systems, a total of eight railcar loads of Kice equipment. Russ and Jim supervised the start up of both mills in Lagos. This job was the largest Kice project to date. About this time, the U.S. government decided to sponsor a big increase in U.S. grain storage capacity. Aeration systems were needed for these projects. Kice developed a control system called the Weather Brain, which was sold exclusively with Kice aeration systems. This feature plus conservative system designs and heavy duty equipment helped Kice to become a leader in grain aeration. It became necessary to find more manufacturing space. A half block of suitable land was located about a mile south of the original building, where Kice Metal Products Co. erected a modest 5000 sq. ft. metal building in 1959. This was designed as the first section of a master plan aimed at adding adjoining sections each year or two as needed. This plan allowed Kice Metal Products to grow without borrowing money. The new section was mainly used to make aeration system components. A second section was added to the new building and the entire plant was moved to the new location. A third section was added the next year, giving Kice a total of some 14,000 sq. ft. including a self-supporting sheet metal dome, originally developed as an experimental approach to low-cost bomb shelter construction – then of great national interest. The bomb shelter interest died almost as fast as it started due to a different policy in Washington, but the all-metal dome provided excellent storage space for flammable supplies for many years until it was finally scrapped. Kice began developing airlock valves for use with their pneumatic conveying systems. This one dates back to 1960. Another new section in 1962 nearly doubled the shop area, and more than doubled the office space, bringing the total space to about 26,000 sq. ft., including an experimental shop. EPA policy favored filters for dust control systems and looked down on cyclones, regardless of their efficiency. Dust control systems were an important part of Kice Metal Products’ business. Kice was purchasing filter collectors for their systems when necessary. None of the available filters worked with Multi-Aspirators® as well as cyclones, because of wide variations in their pressure drop during different phases of their cleaning cycle. Some varied when a section was taken out of service for its automatic cleaning cycle – perhaps every ten minutes. Others varied less often. Even the best available filters varied on a four to eight week cycle, as the bags gradually became plugged by compressor lubrication oil carried by the high pressure cleaning air. Then the system would have to be shut down so the bags could be removed, dry-cleaned and replaced. In all cases, the variations in pressure drop would cause changes in the volume of airflow. The Multi-Aspirator® needs constant airflow. Kice Metal Products developed and patented a new filter cleaning system that cleaned the bags with air at eight to 12 PSIG rather than utilizing plant air. Low-pressure air is supplied by a simple rotary air pump, which is not lubricated internally, and supplies oil-free, clean air. Plant air is supplied by a piston compressor, which must be lubricated internally. The lubrication is entrained with the air and will contaminate the filter media in the filter. The non-electric control system and actuator were powered by low pressure air, from the same rotary air pump that supplied the cleaning air, eliminating electrical hazards. Kice “DynaJet” filters earned an excellent reputation and were quickly accepted by the flour mills and other processing industries. After completing the Nigerian Mills in 1962, Allis Chalmers decided to shut down their flour mill activities. This left the industry without a U.S. supplier, which appeared to be a precarious situation since mills are so essential to our food supply. Kice Metal Products hired two Allis Chalmers engineers – the Group Manager and his Senior Equipment Designer. During the months that followed, Kice Metal Products designed roll stands, purifiers, bran and shorts dusters, etc. – most of the major machines needed in the mill and cleaning house except sifters. Two large double roll stands and two purifiers were built and sold. Last, but not least, Kice Metal Products planned and built most of the equipment for the Ross “Hydraulic Mill.” This little mill was very compact and versatile. Garland King originated its original flow sheet. It was capable of milling 1800 cwt/day of straight grade flour as well as malted wheat or barley. Most of the machines were driven hydraulically, permitting their speeds to be varied as desired for milling different grains. The mill still operates today, 34 years later, with a few modifications. Roll stand sales brochures were actually being prepared when word came that General Mills had shut down nine mills and planned to sell out all the used equipment. Revolutionary “Dyna-Jet” filter system, also developed in the early 1960s by Kice. Obviously, this was not a good time to enter the milling machinery market. . . nor could it be expected to get much better for several years. In the meantime, demand for DynaJet filter collectors was growing rapidly. The decision was not too difficult. The effort that had been devoted to milling machinery was diverted into the filter program. The Environmental Protection Agency was quite aggressive at this time, and Kice filter sales expanded rapidly. The company decided to incorporate and to add two more sections to the north end of the plant. These additions increased Plant I floor space to 45,000-sq. ft. in 1966, the company’s 20th year in business. Bill Kice was 73 years young, spending his winters in Corpus Christi with Mrs. Kice – fishing in the Gulf and traveling – but still quite active at the plant nine months per year, personally handling local purchases – also in training his eight grandsons in basic sheet metal skills. Paraphrasing a TV commercial, “They learned the old-fashioned way. Their Grand Dad taught’em!” Bill enjoyed two more active years in spite of painful arthritis, but the last two were rather inactive, and he died peacefully on November 1, 1971, just a week before he would have been 78 years old. Another plant addition was started before his death, and he had the opportunity to inspect the unfinished building from his wheelchair. This section extended the plant across the street and was planned for efficient production of filters exclusively. Filter sales tended to increase the sale of related products like airlocks, fans and ductwork required for most filter installations. Sales growth required more office space. An elevated office building was designed with column supports, leaving the ground level open for trucks, driveways and shipping, except for the east end which encloses the product development laboratory and basement. This project included a “skyway” above the street that connects the office to the south plant, almost as convenient as it is to the north plant. Filters greatly extended the market for Kice products into many industries besides grain and oilseed processors, Kice Metal Product’s primary market. The volume of orders being received from the secondary markets combined with the decision to abandon the program aimed at total mill construction caused some concern among Kice’s customers about the direction that the company might move in the future. About this time, two of the three European mill builders merged, which left only two firms capable of bidding and building new flour mills – both from Europe. Since neither of these firms needed Kice services, it took little imagination to visualize Kice losing its place in its primary market if and when the new European mills replaced the old U.S. flour mills. A few years earlier, the OCRIM Company of Italy had visited Kice Metal Products and made an offer of the U.S. distribution of their equipment. This was turned down for the reason that Kice did not wish to handle sales for any company other than their own since custom design and special engineering were key factors in the Kice sales philosophy. However, in view of the new situation, Kice Metal Products felt that a third mill building firm should be encouraged to operate in North America to assure healthy competition for new flourmill projects. Kice and OCRIM agreed informally in 1970 that for a five-year period (more or less) OCRIM would establish distribution in North America, and that Kice would cooperate by introducing OCRIM to Kice customers, etc. In return, OCRIM agreed to use Kice air systems, spouting and air stabilization systems when advantageous. The agreement is still working well and has continued because it has been mutually advantageous – not because of any binding contract. It should be pointed out that the agreement is not exclusive. Both Kice and OCRIM do business with the other’s competitors. The purpose of the agreement has been fulfilled, namely to assure healthy competition on new mill projects and the U.S. Milling Industry has benefited. Kice Industries has also benefited by retaining an active position in new mill construction. The arrangement also allowed Kice participation in new, well constructed mills in which the advantages of total air stabilization and coordinated air systems have been proven. Kice predicts that when these advantages are fully recognized, no milling company will consider building a new mill without total air stabilization and well-insulated construction. 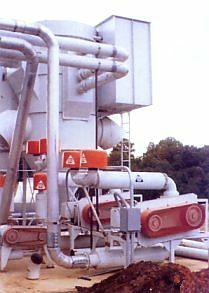 With 25 or so such mills operating at exceptional efficiency in climate extremes from the frigid winters of North Dakota to the extreme dry heat of the Arabian desert – air stabilization is a basic improvement in the art of milling at least equal to pneumatic conveying in potential benefits. Kice expansion in 1970 included office and lab space and a “skyway” connecting the office area to the south plant. The elevated office addition was larger than Kice needed at the time it was built, so extra space was available. It was leased to OCRIM. This arrangement proved to be very convenient and continued until OCRIM outgrew the limited space – moving to larger quarters near the Wichita airport after a few years. This allowed Kice Industries to expand computer operations and other office functions. It was during these years that seven of Bill Kice’s eight grandsons finished school at KSU and other universities and moved into junior executive jobs in the company. It is interesting that all the other sons’ interest paralleled their fathers. Russell’s four sons (J.D., Bill, Bob and Tom) became involved in sales in the office and out in the field. Jim’s two sons (Ed and Dave) were more interested in supervising production. Jack’s younger son (John) took over management of engineering, design and research. An assortment of completed Kice products ready to be shipped out to customers. These were years of continuing growth for Kice Metal Products, and expansion was not confined to the offices. Many new air system components were added to the Kice “Skilled Air” line of products. Production efficiency improved as sales volume permitted departmentalization in the plant. For example, as demand grew for pipe and fittings for dust control systems, the prefab Dust Duct concept was born about 1971. The new department initially set up shop in the original plant. Eventually, Dust Duct outgrew that facility and moved to larger quarters. Also during this period (1970-72) many foundries were shut down due to EPA pollution control regulations and the excessive investment for equipment capable of cleaning up their smoke and other emissions. This resulted in a shortage of gray iron castings needed for Kice airlocks and diverter valves, a shortage of quality as well as quantity. 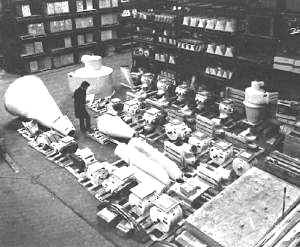 Since every pneumatic lift, most filters and many cyclones needed an airlock, the casting shortage was a serious handicap. After much study, a decision was made to build a new, small foundry designed around the latest foundry processes, except electric melting. Since coke fired cupolas produced the best gray iron because of the natural affinity between iron and carbon in the coke, this method of melting was chosen, even though it made pollution control more complex. Kice designed cupola and pollution control systems, still in use after twenty years of operation. Also, they have since developed better equipment for an advanced system of molding, which has contributed much to production rates and quality. Foundry employees pour iron simultaneously from two ladles. Twenty acres of land in the Blackwell (OK) Industrial Park was purchased and the all-new foundry was built during the winter of 1976, including space for additional Machine Shop and fabrication facilities. The Blackwell plant operates under the name “CFM” subsidiary of Kice Industries. The letters stand for Casting, Fabricating and Machining. The foundry produces quality castings for other manufacturers as well as Kice Industries. The Machine and Fab Shops work exclusively on Kice products. 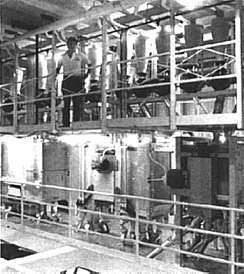 The Blackwell facility was expanded a great deal in 1982, approximately doubling the capacity. More recently, a separate building for pattern work and storage was built near the foundry. Melted iron from the 2,000 pound Brown-Bavari electric furnace. Soon after completing the first stage at Blackwell, the city of Wichita warned that they would “purchase” the original Kice plant (then being used by the Dust Duct Department) to widen the adjacent highway. Kice Industries replaced this space by a large addition to the South plant completed in 1980. The pattern of expansion had been fairly consistent – a new building or addition, averaging about every two years since 1959. However during the recession years, there has been less pressure for new space in Wichita but adjacent land has been purchased. Most new projects since then have been in Blackwell. With some 16 acres of Blackwell land still available, further expansion should be no problem, if and when it becomes necessary. In 1987, the company name was changed from Kice Metal Products Co., Inc. to Kice Industries, Inc. The 1990s brought two major developments to Kice Industries. While acknowledging that some of its new endeavors may take the company in directions that even it cannot fully predict, Tom Kice the company’s president, is quick to point out that the company remains firmly rooted in a tradition of engineering innovation and committed to meeting the needs of the flour milling and other industries that convey and process bulk commodities. The other major development during the 1990’s was Kice’s commitment to grow into other industries. Kice has achieved growth in recent years in areas other than grain-based foods. Having stretched the manufacturing capacity of its 125,000 square-foot south Wichita plant to the maximum, Kice built a new $3-million facility completed in October of 1996, that houses the company’s corporate offices and 50,000 square feet of additional manufacturing space. The new facility is located on a 25-acre tract in Park City, just north of Wichita. The new manufacturing facility handles sheet metal work, painting, flourmill assembly and shipping. A high bay area with 40-foot sidewalls allows more complete assembly than was previously possible. Unlike the south Wichita facility, the Park City plant is away from residential neighborhoods, and multiple shifts are possible. The start of the 21st Century brought two more significant changes to Kice Industries. The City of Wichita began construction on a number of railway projects aimed at increasing rail traffic and decreasing traffic congestion caused by rail traffic. Part of the city’s plan included the purchase of Kice’s original manufacturing facilities in South Wichita. In 2003 a deal was struck with the city and the construction of a new, state-of-the-art manufacturing facility was begun at the company’s current office location. Located on the north side of Wichita in Park City, KS, Kice owns 25 acres with plenty of room to grow. The new building brings the entire Kice manufacturing process back together in one location. Russell Kice and Jack Kice both passed away during 2003. Both will be missed greatly. However, both left a legacy that can be seen in the fourth generation of Kices who are now a part of Kice Industries. In 2006 J.D. Kice officially retired, and brother Bill followed in 2007. Although officially retired, they fill a consultation type role for the company. Jim Kice passed away on July 18th, 2009. Jim was the father of Ed and David Kice. Jim’s dedication and commitment to Kice Industries was a major part of the company’s success. He will be missed by all who had the privilege to know him. In October of 2009 the Kice Board of Directors approved the appointment of Drew Kice as president of Kice Industries, Inc. Tom Kice maintains his position as C.E.O.